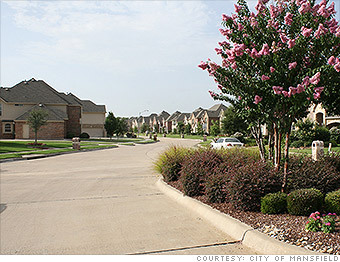 One of the fastest-growing cities in the nation, Mansfield boasts an increasing number of jobs, a prime location about half an hour from Dallas/Fort Worth, affordable homes, and strong schools. Meanwhile, its city-owned water park and Big League Dreams baseball complex are drawing in tourist dollars. New schools are being built (Mansfield's sixth high school will open this August). City spokespeople say they aim to preserve a small-town feel, but that might be hard: 50% of the land in Mansfield is still underdeveloped so more growth is on the horizon. --L.G. Is Mansfield a great town, or what? Due to erroneous job, cost-of-living, and test score stats for a small number of places, this city's rank changed slightly from an earlier version. Details. Most of Austin is located within Travis and Williamson counties and is subject to an 8.25 percent sales tax. However, part of the city lies in Hays County and is subject to a total rate of 7.25 percent.